The continuing volcanic eruption of Kīlauea volcano on Hawai‘i Island began in early May and has gained international media attention, as it’s destroyed 700 homes, completely filled in an important ocean bay, covered a lake in lava, and has forever altered the landscape across hundreds of acres. The Hawai‘i Emergency Management Agency and the Governor’s Office called for State Executive Branch public information officers to volunteer for deployment to the Hawai‘i County Civil Defense Agency and its Emergency Operations Center (EOC) to assist during the disaster. Three PIOs and one senior communications manager (me) stepped forward, perhaps without full knowledge of what this deployment would involve. My first tour of duty began on Memorial Day and was scheduled for six days (cut short and more on that later). Duty hours in the EOC, unbeknownst to us at the beginning, were from 6:15 a.m. – 6:15 p.m. and longer if necessary. Our primary responsibility was to gather information from scientists (USGS and Hawai‘i Volcanoes Observatory), county/state/federal emergency management officials, FEMA reps, State Health Dept. experts, my own agency’s law enforcement division, county police and a whole host of individuals and agencies assigned to the EOC during the height of the current eruption. Public information statements were written by us, reviewed by the county civil defense director (or a deputy), recorded for local radio stations, and then posted by the PIOs on a variety of government websites and social media platforms. This was to ensure broad distribution of key public safety messages and warnings. These messages were created and distributed three to five times daily, depending on current circumstances. My regular job entails a great deal of interaction with local, national and international media. For EOC duty, the county brought on the Mayor’s public information officer, and she and FEMA representatives fielded the bulk of the hundreds, if not thousands, of media inquiries received during the first 60 or so days of the active eruption and lava flows. 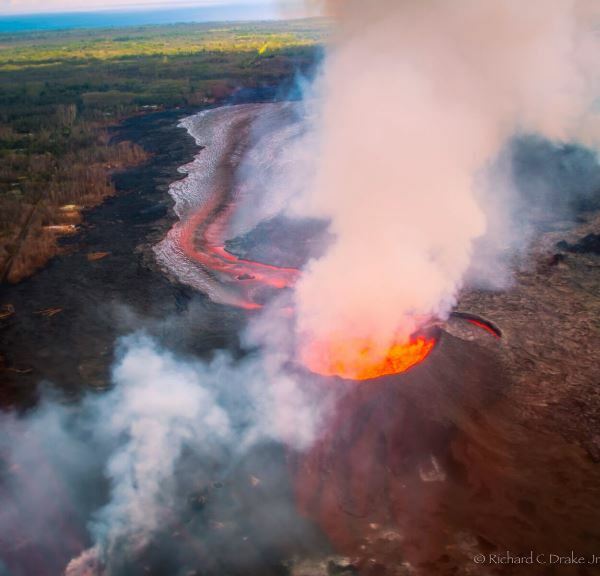 Additionally the Hawai‘i Army National Guard was deployed not only to help man numerous checkpoints on roads and highways, but initially to conduct and lead twice-daily media tours into the active eruption area. I was fortunate to join in on a particularly good tour after my third day in the EOC. Our National Guard escorts took us to two locations, where we could photograph and videotape the now-famous Fissure 8 activity, including its 200-foot high fountain. The National Guard’s primary media person consulted with me several times on whether they should include academics, scientists, documentary filmmakers, etc. on these tours. Given the high media interest, I recommended that they restrict the tours to credentialed members of the media, and this became the procedure they followed. Upon further investigation we learned the CNN reporter had used subterfuge when checking in and getting a required safety briefing at a county fire station. He told the folks there he was part of the university drone crew and did not reveal he was a member of the media. The next day the county PIO called the CNN assignment desk to notify them that this reporter would be banned from further access to the active lava zone, including the regularly scheduled twice-daily media tours. On the second-to-last day of my first deployment I woke up not feeling particularly well. I traveled with the media and the Hawai’i Dept. of Transportation (DOT) to the Chain-of-Craters Road in Hawai‘i Volcanoes National Park. The road was closed five years ago after lava covered it, but the decision was made to try and clear it to provide emergency evacuation access if needed. I proceeded to shoot video and photos for DOT, and while walking back to our cars my churning stomach finally gave up its contents. Pele is the Hawaiian demigod associated with volcanoes, and you could say she took her vengeance out on me…my personal lava flow continued unabated throughout the rest of the day, which forced me to end my initial EOC deployment a day early. I returned to the emergency operations center in Hilo for a second week-long tour in mid-June. This time around not only was I better versed in the daily required tasks and duties, but the EOC seemed calmer and more in control, perhaps because by this point the active eruption was entering its sixth week. I’d planned to return for a third tour just prior to the ACI conference in late July, but the county decided not to request additional assistance from state public information types. Working in the EOC was a good learning experience; in fact, I was encouraged to apply for the open PIO job for the Hawai‘i Civil Defense Agency. I passed, not only because I have the greatest government communications job in the world (or at least in Hawai‘i) and I learned (much like working on a TV newsroom assignment desk) your day could switch from abject boredom to pull-out-your-hair chaos in a flash. Don’t mind the chaos, hate the boredom. I do feel incredibly fortunate for the overall experience but particularly for the chance to get in the field four different times to document the total destruction and awe-inspiring power and mesmerizing hold of Madame Pele and the Kīlauea volcano.